The low-cost regional airline's tie-up with Aer Lingus is the latest leg in its turnaround plan. No more will Highlanders have to drive hundreds of miles to Edinburgh or the good people of Exeter risk getting stuck in the M4 carpark on the way to Heathrow to catch a flight to North America. Low-cost airline Flybe is now offering single tickets to the US and Canada from its regional hubs through a tie-up with Aer Lingus. The ‘codeshare agreement’ means passengers flying from Southend, Southampton, Inverness and Exeter can connect with Aer Lingus’ 10 daily transatlantic flights from Dublin to cities including New York, Boston, San Francisco, Chicago, Orlando and Toronto. Flybe already has similar agreements with British Airways, Air France, Etihad, Finnair and KLM, meaning it can offer single-ticket flights to destinations as random as Jyväskylä (a city in central Finland in case you were wondering) and Lagos (in Portugal, not Nigeria). 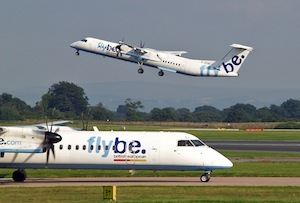 The latest deal comes hot on the heels of its announcement of routes from London’s City Airport to Aberdeen, Belfast, Dublin, Edinburgh, Exeter and Inverness at the end of last month, in a bid to target business passengers. The new routes are part of the turnaround plan flown in by chief exec Saad Hammad, who was parachuted in to run Flybe in August 2013. The company’s pre-tax profits were £8.1m in the year to March, a sizable improvement from the £42.2m loss it made the previous year. Its half-year results out on Wednesday will show whether it’s still gaining altitude.